The soulful singer-songwriter connects the world through sound. 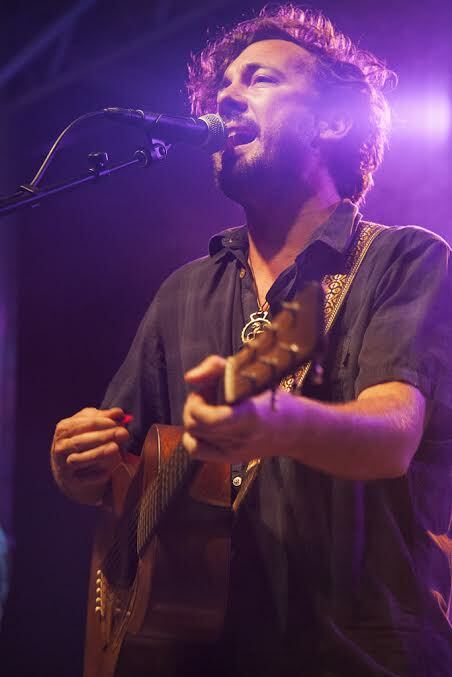 O’ahu-based singer-songwriter RootHub believes that music has the ability to explore the interconnectedness of all beings. RootHub’s love of music is all the more enthralling because he was born without auditory sense. In one of his songs, he sings, “when I was a little fragile child / The spirits yes they spun me round and round / I couldn’t hear a whisper of anything around except the sound of angel’s hammers coming down.” When he was two years old he underwent a surgical procedure that enabled him to hear for the first time. “I remember the sound of the metal of the bathtub faucet, the rushing of the water, and the sound of my own voice screaming out in fear. That must have been the beginning.” He describes his memory of this time as an impressionist painting. The details are murky, but he does recall vividly an overwhelming flood of sound. RootHub moved from his birthplace of LA to Hawaii in 1995. The move had a profound effect on his view of music. The energy in LA was a lot more success-driven. In Hawaii, he was able to find his own voice without the inhibiting stress of trying to “make it.” There wasn’t the same sense of competition, which allowed him to truly hone in on his own practice without fear. An integral component of Hawaiian culture is Kanikapila, or jamming. People commonly gather and create music for the experience rather than for the end result. This, he notes, is a lot like yoga, which is why the shift toward mindful music was such a natural one for him. When he first began writing his own music, he would often walk along a trail into a secluded valley where he could experiment with his own sound. Being in nature, he says, helps him feel fully present and tune into the moment. Although he was alone physically, finding his voice through the lens of other musicians he admired helped him feel a deeper connection to the world around him. It’s a lot like the C.S. Lewis quote, he says. In the same way that “we read to know we are not alone,” we play and listen to music to relate to others, and in turn find ourselves. RootHub has played festivals around the world, including Wanderlust, Burning Man, and Hawaii Yoga Festival. We discuss the art of performance and he tells me the best advice he’s ever received about being on stage. “I had a trusted friend tell me, ‘Take the leap of faith and look everyone in the eye.’ That was a game changer.” For a long time, he says, he unconsciously put up a protective wall between him and his audience, fearing that they were somehow taking something from him. Over time he realized that just the opposite was true: “People can set you free.” The audience is offering themselves to you. There’s a mutual engagement. RootHub has meditated on this and learned to find grounding no matter the circumstance. 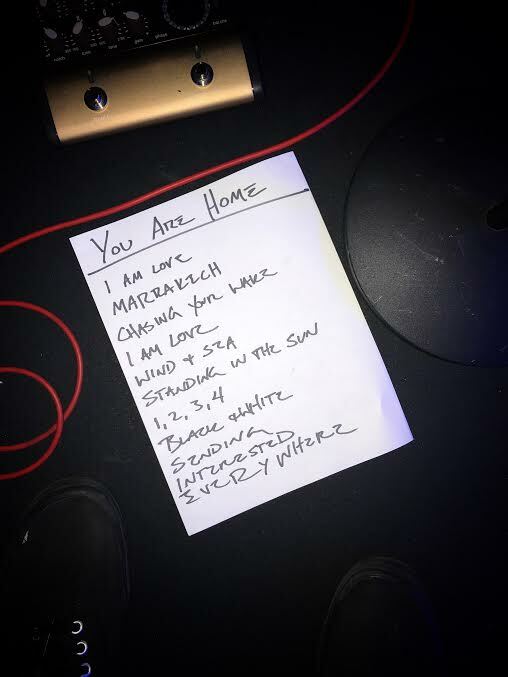 “I usually write ‘I AM HOME’ on the top of my set list. It reminds me that no matter where I am, I am in my body and I am doing exactly what I came to earth to do.” You never can know what will happen at a performance, and this can either be the most challenging or the most exciting aspect of the show. “There is magic in any performance if you ask for it,” he says. These days, RootHub travels the world playing shows and teaching others how to tap into their innate sound. He cofounded a workshop with close friend and yoga teacher (and fellow Wanderlust presenter) Erica Jago, who he met through a mutual friend at Burning Man. The two began collaborating on weekly yoga classes set to live music on the North Shore. This opportunity transformed RootHub’s approach to music. “I began mirroring the teachings and the rhythm of the breath and movement through spontaneous melodies and lyrics,” he says. Erica invited him to accompany her at a retreat she was leading in Bordeaux. But she had one condition: RootHub would have to consider something that he would like to teach. He thought about “thinking things into being” and the countless creation stories that begin with sound. He composed a workshop that would create a safe space and allow people to connect through sound.